I’ve been so enamored by meat the past few years that I had forgotten how much I loved cooking vegetarian food. I still cook tempeh rather often, but usually utilize it in the same way repeatedly without branching out. I also never cook with mushrooms, having had a phobia of them since being diagnosed with Lyme Disease as a child, where you’re taught to avoid foods grown underground or with high contents of mold. Mushrooms being a mold, these were off-limits. 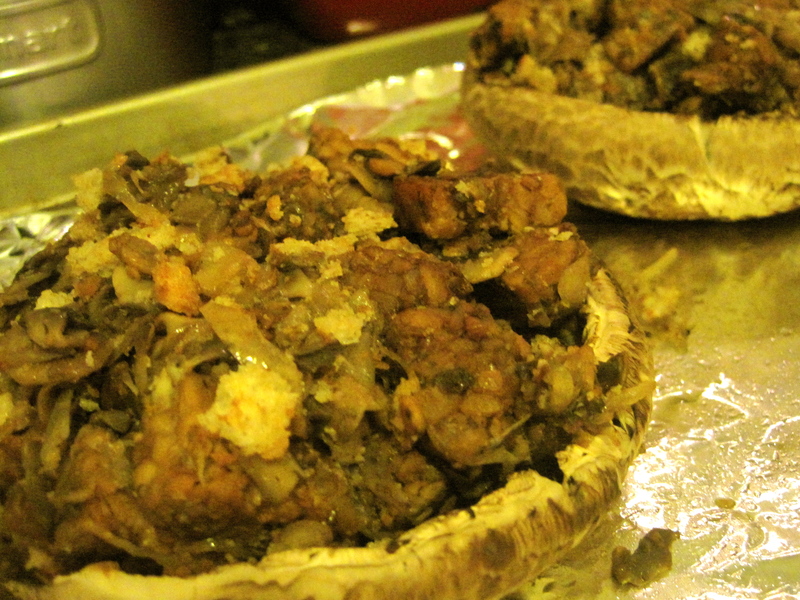 But in my attempt to add some variety in moderation to my diet, and to appease my once-vegetarian boyfriend, AND because I saw a great stuffed mushroom recipe on Saveur that I played with for a New Years gathering, I grabbed some portabellas and got to cooking. Quick notes: I made breadcrumbs by toasting 2 slices of gluten-free bread, letting them sit while I prepped, and then ran them through the food processor. Tempeh is easily found at most health food stores and some major grocers. Marsala wine is a salty cooking wine that can be found in the vinegar section of most stores. Make sure to rub your mushrooms clean and not rinse them, as they easily absorb unwanted moisture. Line a baking sheet with aluminum foil and spray with non-stick spray. Place mushrooms, cap down, on tray. Heat a large stainless steel skillet on medium heat, add about 3 rounds of olive oil (about 4 tbsp), and bring up to heat. Add mushrooms and slices onion, turn heat to medium/low, and cook until softened, stirring occasionally and setting heat to low if necessary (depending on your range, you’ll want them to sweat and soften, not brown). When soft, add Marsala wine and mix in thoroughly. Cook until the wine is absorbed. Remove from heat and place in a large bowl. Return pan to heat and add another 2 tbsp of olive oil. Add tempeh and turn heat to medium. Cook tempeh, turning constantly, until brown on all sides. Add tamari and cook until absorbed, turning constantly. Add tamari to bowl and mix with mushroom mixture. Fill into mushroom caps, bake for 15 minutes or until portabellas are soft. I served this with shaved Brussels sprouts cooked with a little vinegar and sesame seeds, and quinoa. They’d also be great with a big salad or a side of mashed potatoes or mashed cauliflower.